The Dark Ranger: Mess Is In! Even before he became a New York Ranger on Oct. 4, 1991, Mark Messier already had the credentials of a future Hockey Hall of Famer. He did, after all, have five Stanley Cup rings, a Hart Trophy as the NHL MVP, a Conn Smythe Trophy as the playoff MVP, four postseason All-Star selections and eight All-Star Games under his belt. But it was the work that Messier did over the next several seasons with the Rangers that made the eventual decision to put him into hockey's hallowed Hall a complete no-brainer. On Thursday, Messier earned hockey's ultimate honor when the selection committee announced that he would be one of four players inducted at a ceremony in November. Also voted into the Hall of Fame on Thursday were former Hartford/Carolina and Pittsburgh star Ron Francis, longtime New Jersey Devils captain Scott Stevens, one of two defenseman honored along with former Calgary and St. Louis blueliner Al MacInnis. In the builder's category, the committee honored longtime NHL executive Jim Gregory with induction. Of the four players, none could have been an easier choice than Messier, a winner of six Stanley Cup championships and the NHL's second all-time leading point scorer behind Wayne Gretzky. Messier's 694 career goals place him No. 7 on the all-time goal-scoring list, and his 1,193 career assists rank at No. 2. In two stints with the Rangers from 1991 to 1997 and from 2000 to 2004, Messier continued to add to the amazing resume he brought with him from Edmonton. As a Ranger, he would win another Hart Trophy, another postseason All-Star selection and play in five more All-Star Games. "On behalf of the entire Rangers organization, I would like to congratulate Mark on being selected to the Hockey Hall of Fame. From our time together with the Edmonton Oilers up until our reunion with the Rangers, I have witnessed Mark's incredible impact on the game of hockey and the city of New York. His leadership skills, both on and off the ice, have been exemplary to our organization," said New York Rangers President and General Manager Glen Sather. It was also in a Rangers jersey that Messier passed Gordie Howe to become the highest-scoring NHLer not named Gretzky, and it was within months of his Sept. 12, 2005, retirement that he became only the fourth former Blueshirts star to have his jersey retired. Of course, the one Messier accomplishment that no Ranger fan will ever forget was the role The Captain played in leading the team to its first Stanley Cup in 54 years. 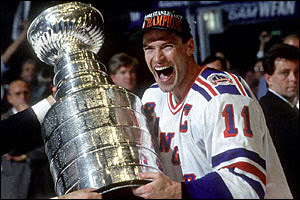 Because on June 14, 1994, Messier accepting the Cup from NHL commissioner Gary Bettman and ended a "curse" that had hovered over the franchise for half a century. That achievement alone could only have been the work of a future Hall of Famer. "He was the prototypical player," said longtime teammate Adam Graves, who played on Stanley Cup champions with Messier in both Edmonton and New York. "If I could build a hockey player physically, skillfully, emotionally and tangibly, then Mark would be that player. His ability to connect with his teammates. His ability to intimidate. His ability to score. His ability to skate. His ability to control games and his ability to meet the challenge at the most appropriate times in the biggest games makes him the most complete all-around, emotional leader and player that I've ever seen." Messier's fellow Hall of Famer Stevens echoed Graves' sentiments. "Mark could play in any situation and do it with the best of them," said Stevens. "There wasn't much he couldn't do." Messier, Steves, Francis and MacInnis all played their final NHL games prior to the 2004-05 NHL lockout, and were Hall-eligible for the first time on Thursday. While this impressive group made it into the Hall, they rounded out the maximum number of four players allowed in any given year. That meant some big names missed the cut and will be prominent on the ballot again next year. The group that missed out on this year's Hall voting includes Adam Oates, Igor Larionov, Phil Housley, Dino Ciccarelli, Doug Gilmour and former Ranger Glenn Anderson. While the selection of new members took place on Thursday, the induction ceremony is not scheduled until the weekend of Nov. 9-11, 2007, in Toronto. That weekend is sure to see a large group of the Garden Faithful on hand to salute The Captain on another remarkable achievement in his legendary career. "It's great to see him enter a place where he obviously belongs as one of the greatest players to ever play the game," said Graves.